Taco Tuesday Bicycling Kick-Off: MAY 31st! Men’s Softball League Now Forming! 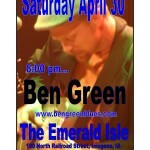 Benji Green Live This Saturday, April 30th!